﻿?Looking for Alibrandi? 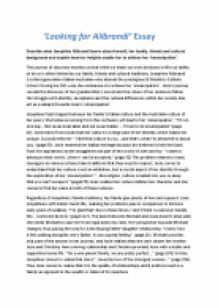 Essay Describe what Josephine Alibrandi learns about herself, her family, friends and cultural background and explain how her insights enable her to achieve her ?emancipation?. The journey of discovery teaches us that while we make our own decisions in life our ability to do so is often limited by our family, friends and cultural traditions. 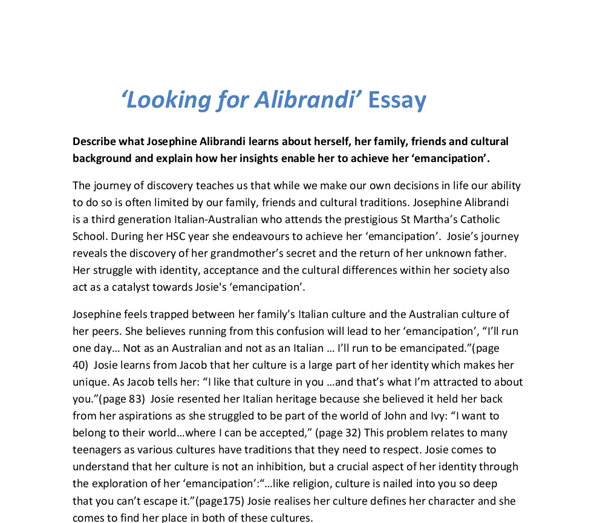 Josephine Alibrandi is a third generation Italian-Australian who attends the prestigious St Martha?s Catholic School. During her HSC year she endeavours to achieve her ?emancipation?. Josie?s journey reveals the discovery of her grandmother?s secret and the return of her unknown father. Her struggle with identity, acceptance and the cultural differences within her society also act as a catalyst towards Josie's ?emancipation?. Josephine feels trapped between her family?s Italian culture and the Australian culture of her peers. She believes running from this confusion will lead to her ?emancipation?, ?I?ll run one day? Not as an Australian and not as an Italian ? I?ll run to be emancipated.? (page 40) ...read more. Josie empathises with Katia?s harsh life, realising her problems pale in comparison to Nonna's early years of isolation, ?I?m glad that I live in these times. I don't think I could ever handle the? world she lived in. "(page 117). The bond between Michael and Josie doesn?t arise until she needs Michael to save her from legal action by Carly. Her perspective towards Michael changes, thus paving the way for a developing father-daughter relationship: ?I knew how it felt walking alongside one?s father. It was a great feeling.? (page 16) Michael provides only part of the answer in her journey, and Josie realises that she can?t desert her mother. Josie and Christina, have a loving relationship and Christina provided Josie with a stable and supportive home life. ?For a one parent family, we are pretty perfect?? (page 195) In time Josephine comes to realise that she is? ?loved by two of the strongest women?? (page 226) ...read more. ?You?re a leader because what?s inside of you...? (page184). Josie realises how influential she is among her peers though she has always considered herself to be an outcast. ?You and your friends are trendsetters?? (page182). Josie matures after apologising for her irresponsible actions-?I think my ?emancipation? came at that moment,? (page185). To be admired you have to stand up for what is right rather than conforming to the expectation of your peer group. As Josie proceeds through her H.S.C year at St Martha?s, she faces and overcomes problems with the truth. As she matures, Josie comes to understand that her family background has not limited her future, but is an essential part of her identity. Josie stating, ?If someone comes up and asks me what nationality I am, I?ll look at them and say I?m an Australian with Italian blood flowing rapidly through my veins.? (page 258) Josie comprehends that it is not what you are and what you do, but who you are that makes a person free to accomplish their ?emancipation?. 822 words ...read more. This student written piece of work is one of many that can be found in our GCSE By Author section. This can also shows how she makes the effort and dresses to attract sexual attraction from the ranch hands. ?...rouged lips ... fingernails...red, red mules...of red ostrich feathers?. The repetition of colour red could be interpreted as a colour of danger and she brings only danger to people. assembly recognizes that Jack will interrupt when he wishes, regardless of the rules. Jack?s eagerness to enforce strict government on the island represents totalitarian regime. The dictator desires to create rules, since when rules are present, so is punishment. However, the rules never imply to the dictator himself. Gatsby feels as though he is not good enough for Daisy and as a result he compensates later on by putting on an extravagant show of wealth. of muzzle and with pale, blind old eyes? Candy put?s up his compensation money for losing his hand towards George and Lennie?s land, so he can leave the ranch before he is made to leave, because of his age he can easily be replaced.